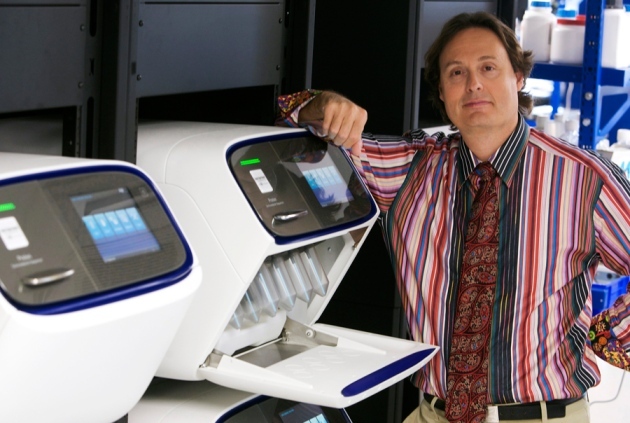 I met Jonathan Rothberg, a real pioneer in genetic sequencing technology, at Scifoo back in 2008 (see Gene machines). Jonathan’s foundation is now backing an effort similar to the BGI Cognitive Genomics project. He may not remember, but we had a long conversation about this topic on the bus from the hotel to the Googleplex. I’ve agreed to participate in Project Einstein (I am not worthy!) as a DNA donor, and I hope that our projects will someday share data and resources. Rothberg’s attitude is typical of a true innovator: damn the critics, full speed ahead! Nature: He founded two genetic-sequencing companies and sold them for hundreds of millions of dollars. He helped to sequence the genomes of a Neanderthal man and James Watson, who co-discovered DNA’s double helix. Now, entrepreneur Jonathan Rothberg has set his sights on another milestone: finding the genes that underlie mathematical genius. Rothberg and physicist Max Tegmark, who is based at the Massachusetts Institute of Technology in Cambridge, have enrolled about 400 mathematicians and theoretical physicists from top-ranked US universities in a study dubbed ‘Project Einstein’. They plan to sequence the participants’ genomes using the Ion Torrent machine that Rothberg developed. The team will be wading into a field fraught with controversy. Critics have assailed similar projects, such as one at the BGI (formerly the Beijing Genomics Institute) in Shenzhen, China, that is sequencing the genomes of 1,600 people identified as mathematically precocious children in the 1970s (see Nature 497, 297–299; 2013). There is precedent to the concept of sequencing extreme outliers in a population in the hunt for influential genes. Scientists have used the technique to sift for genes that influence medical conditions such as high blood pressure and bone loss. Some behavioural geneticists, such as Robert Plomin at King’s College London, who is involved with the BGI project, say that there is no reason that this same approach won’t work for maths ability. As much as two-thirds of a child’s mathematical aptitude seems to be influenced by genes (Y. Kovas et al. Psychol. Sci. 24, 2048–2056; 2013). … The Rothberg Institute for Childhood Diseases, Rothberg’s private foundation based in Guilford, Connecticut, is the study’s sponsor. But Rothberg won’t say who is funding the project, which other geneticists estimate will cost at least US$1 million. Some speculate that Rothberg is funding it himself. In 2001, Fortune estimated his net worth to be $168 million, and that was before he sold the sequencing companies he founded — 454 Life Sciences and Ion Torrent, both based in Connecticut — for a combined total of $880 million. Rothberg is adamant that the project is well worth the time and the money, whoever is paying for it. “This study may not work at all,” he says — before adding, quickly, that it “is not a crazy thing to do”. For a multimillionaire with time on his hands, that seems to be justification enough. Let me repeat the scientific motivations for this type of project. The human brain is arguably the most complex object we know of in the universe. Yet, it is constructed from a blueprint containing less than a few gigabits of information. Unlocking the genetic architecture of cognition is one of the greatest challenges — now feasible in the age of genomics that Rothberg and others helped bring into existence. For a discussion of previous GWAS results on general cognition, and their implications for the prospects of studies like Project Einstein, see First GWAS hits for cognitive ability. For general background on the science, watch this video. Or read these: MIRI interview, FAQ.